A natural diet is one where your pup/dog is fed mainly raw food. We believe it is both the best diet for your pup/dog and as cheap as, or cheaper, than buying premium commercial dog food. About 70% of this diet consists of raw meaty bones. NEVER feed your dog cooked bones as they can splinter. The bones we use are mainly chicken necks, chicken wings and carcasses, lamb necks and beef brisket bones. Chicken mince made from whole carcasses is also an excellent food. The remaining 20% of the diet should be vegetables and fruit and about 10% of the diet should be cereals. Dogs do not digest cereals very well but the fibre helps to keep the bowels in good order. Remember do not try to make every meal balanced as this is accomplished over a period of one to two weeks. All of the food that is fed on a raw diet is easily digested and readily metabolized in the body. There are no “empty” calories nor high-calorie, low nutrition ingredient "fillers" which are not only difficult to digest, but not very filling, thus requiring your dog to eat a large amount of food before he/she feels full. An added bonus is that on the raw diet the amount of droppings produced by your dog usually decreases (and the droppings don’t smell as much either). Note, the droppings usually turn white as any excess calcium is secreted out. Aside from your pet's size, other factors will impact the quantities of food that you serve. Activity level is a factor, as less active dogs may need less food and extremely active dogs will need more. 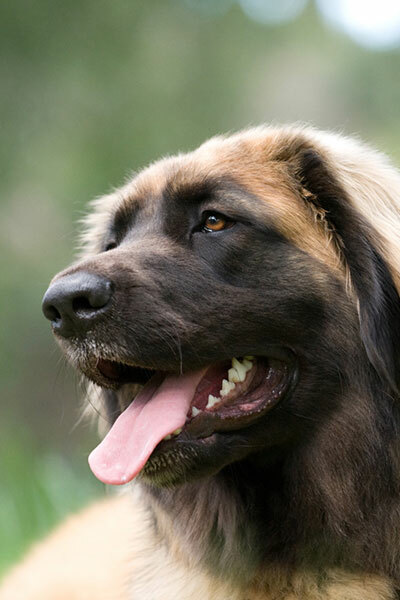 Some breeds have a higher metabolic rate than others. Medical conditions may require further quantity adjustments to attain optimal health. Overweight dogs will benefit from reduced quantities. On the raw diet, losing weight does not mean lowering nutrition. Calories are reduced, but nutrition-vital to healthy weight loss, is increased. Your dog will lose weight and gain muscle, making it easier to maintain his/her optimal weight once he/she gets there. Age is a serving size factor, as well. For puppies, feed a total of approximately 10% percent of their body weight, divided into three or four meals. If, for example, your puppy weighs 10 kilograms, you would feed a total of one kilogram per day. For adult dogs, feed 2% to 3% of body weight, divided into two meals. If your dog needs to lose weight, these quantities should be adjusted. An overweight dog should be fed approximately 2% of its body weight until he/she reaches his/her ideal weight. Very active dogs may need more food - begin with 3% of body weight. Remember these quantities are estimates. Your dog may need slightly more or less. Try to keep your dog lean for a long, healthy life. It is a good idea to regularly weigh your dog at your local vet clinic to monitor his/her weight. If you have a young puppy, Do not supplement the diet with additional calcium. Raw meaty bones provide the perfect balance of calcium, phosphorous, and minerals. The addition of extra calcium can be harmful and may cause Osteochondrosis Dessicans (OCD) and/or kidney problems. To ensure an adequate intake of iron, particularly in a young pup, feed a meal which includes some minced beef, lamb or pork along with some offal two to three times each week. This includes such food as lambs fry (liver), chicken livers, lamb, pork or beef kidneys, lamb hearts and chicken giblets. Liver is a very good food but needs to be used in moderation as it is high in fat soluble vitamins, eg Vitamin A. as too much liver can poison your dog. We also feed tinned mackerel, sardines and tinned tuna, usually twice a week with pasta. Our dogs are fed vegetables which are raw and have been pureed in our juicer and the juice added back into the mix. Our vegetable mix usually contains bok choy, celery (including the leafy part), cauliflower, broccoli, carrots, sweet potato, apple and garlic. Other vegetables we sometimes use include mushrooms, mung beans and brussel sprouts but do not add raw potatoes or any onion as they can be toxic for dogs. There is also a commercial veggie mix called Big Dog BARF. BARF is available from All Breeds. We usually add 1-2 tablespoons of the veggie mix into a mince meat and add some offal (eg a pork kidney or a lamb heart) as well as about 1-2 teaspoons of oil. We fed this usually 2-3 times each week. Note: We do not add cod liver oil to our mix if liver is included in the meal. We fed a porridge mix once or twice a week using quick cooking rolled oats. Cover the oats with boiling water and cook for a minute or two.. Add a raw egg into the hot mixture along with raw honey, molasses and milk/yoghurt. We use honey as a sweetener in their stewed fruit as well as their porridge mixture. I also feed Vita Brits or Oat Brits with the honey, molasses, milk, eggs mixture etc. We use ordinary cow’s milk and have never had any problems with it. Other products we use are eggs, cottage and grated cheese, and yoghurt. All fresh food that we use is classed as being fit for human consumption. We DO NOT RECOMMEND dog meat. Kelp/Seaweed powder/granules/liquid – we recommend a teaspoon be given each day. Vitamin E tablets – should be given whenever your dog is given oil. Garlic – we recommend 1 clove of garlic to be added to the veggie mix. Garlic is a natural insecticide and helps in the control of fleas. Vitamin K - fresh dark green leafy vegetables such as outer leaves of lettuce, cauliflower, broccoli, brussel sprouts, spinach; fresh liver, fish. IF YOU DO DECIDE TO SUPPLEMENT WITH A COMMERCIAL FOOD, PLEASE ENSURE IT IS ONE SUITABLE FOR THE AGE AND LIFESTYLE OF YOUR DOG.